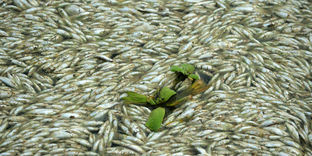 Looks like China has another environmental disaster on their hands with 100 tons of dead fish in the Fuhe river in Hubei province. The deaths resulted from an ammonia spill at a chemical plant. I thought I detected glimmerings of environmental awareness in China, but it may take a while before they make much progress in slowing pollution and cleaning up their mess. The Chinese leadership should have this catastrophe on their conscience, as well as the general condition of the environment in China and ecological impact beyond their borders. If these catastrophes are on their conscience, maybe they will be motivated to move faster in solving their country’s environmental problems. I can think of at least three things that would be required. They would have to have consciences. Additionally, they have to care about damage to the environment, whether it’s ravaged terrain, dead citizens, or dead fish. And, they would have to see some connection between their personal roles in society and the undesirable contamination. We humans are apparently not born with a conscience, but normally develop one at an early age. Grazyna Kochanska and Nazan Aksan at the University of Iowa have done a longitudinal study on the development of conscience and published their findings in a December 2006 Journal of Personality article, “Children’s Conscience and Self-Regulation.” They found evidence of “distress following transgressions” as early as age two. The concept of conscience is associated with guilt, the emotion. Guilt has been categorized as a social emotion, possibly having to do with our existence in a social context and shaped through socialization. It is also a moral emotion, regulating our behavior in relation to notions of right and wrong, which may be culturally determined. There are individual differences in the feeling of guilt and in the development of conscience. For some guilt is all too common, often appearing in inappropriate situations. For others, guilt is rare. These people sometimes seem to have no conscience at all. Children deficient in guilt apparently are at risk for conduct disorder, aggression, and antisocial personality disorder (psychopaths). History will reveal whether the Chinese leadership takes responsibility for the environmental catastrophes within their borders. I doubt they will be exonerated on the basis of participation in progress toward greater prosperity and the good of the people, no matter how laudable those goals. 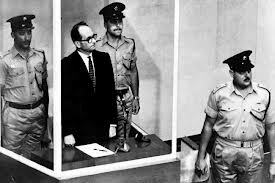 Adolf Eichmann was sentenced to death.